Next Door Mama – Wouldn't it be great to have a mama friend who lived next door to answer all of your questions? Until the end of last week, Clarissa was pretty adamant that she wanted a little brother. I was confused because she spent the past three years asking for a little sister. She finally told me why. She doesn’t want to share her toys. An only child for five years gets used to having her own things. Clarissa assumed that if she had a baby sister, she would grow up to want to play with all of her toys. But a little brother would ignore her girly toys and play with his own. When I explained that a little brother would want to play with her toys too, she was very confused. On Monday, the realtor asked Clarissa if she wanted a brother or a sister. She responded “both” and kissed my tummy. I guess Tim will name all of our children. The name Clarissa was his idea and it took a few days to grow on me. This time it did not take as long. As we were walking out of the hospital, he said, “What do you think about Tiffany?” Tiffany means manifestation of God. Upon further research, Tiffany is a translation of the word epiphany and is often given to girls born on January 6. We actually found out that we were pregnant on January 6. By the time we arrived at dinner, the three of us agreed that her name is Tiffany Grace so “manifestation of God and grace.” This is the perfect name for her. If we got pregnant when we first started trying, she would be due in June which would be either very difficult or not possible with our PCS (moving) date. This way, our furniture that will take at least 3 months to arrive to our new house should arrive in August. We will have plenty of time to get our new home set up and comfortable before Tiffany comes in mid September. We didn’t know the timing of any of this, but God knew. And it also fits with the word that God gave me in the beginning of the pregnancy that “mercy and grace would follow me all the days of my life and I will dwell in the house of the Lord forever.” Tim also had a vision a while ago that this child would be in ministry. We of course followed dinner with a trip to the px to find some cute little girl clothes. We each had a different favorite, so we bought them all. I think that the reason that we could not tell the gender at the last ultrasound was that four weeks ago Clarissa was adamantly against having a baby sister. Now Clarissa is very excited about her baby sister. I think it helps that she has a name now too. I have been reading to Clarissa since before she could talk. At first, she chomped on the books as I read them. But eventually she learned to sit and look at the books. We had several favorites when she was really small. These are our favorite books for babies and toddlers. I loved the repetition in this book. “It’s time for bed little sheep, little sheep. The whole wide world is going to sleep…” Clarissa loved the animals in the book. I would say goodnight and call her a different animal every night. Clarissa really liked this one, I think because of the bunny. It rhymes and has decent pictures. As a bigger kid, she was confused about why they said goodnight to so many objects because “you don’t need to say goodnight to air.” But as a baby, she loved it. Clarissa loved this one because of all the animals. She liked to tell me the names of the animals in the pictures. I liked that she was learning that God made everything. This is another rhyming book with wonderful pictures. I loved that this book taught Clarissa that no matter what, Mommy would always love her. And that even as a grown up she would know that she was loved. This is one in a series of books about Little Cub and her family. This one explains how Mommy and Daddy were excited that God was giving them a baby and some of the anticipation they had for baby’s birth and then what life was like when they brought baby home. She liked the bears. This was Clarissa’s favorite book for about a year. She loved that the bunny and her mom had a hug like every hour of the day. I think she also liked that Daddy would hug her every time it happened in the book. This would also be a great book to teach little kids about a schedule. Clarissa loves art. She is constantly creating art and craft projects. 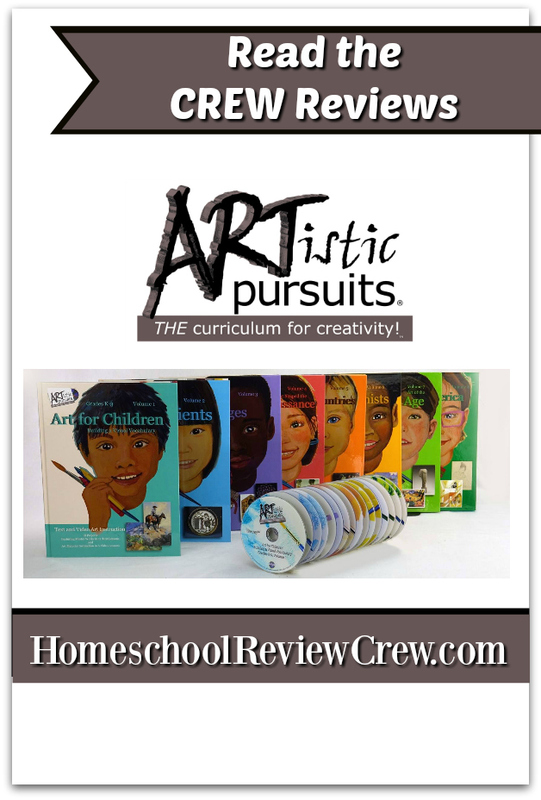 I was so excited when we were given the chance to review ARTistic Pursuits Inc because they have a full art curriculum that will teach Clarissa more than I can with their K-3rd Grade Art Level, Volumes 1-8. With eight volumes, there is something for every family’s needs. For my kindergarten student, we chose Volume 1 Art for Children: Building a Visual Vocabulary. I was really impressed with it. There are 18 lessons included in this art curriculum. Some lessons require a DVD for instruction and others just have lessons in the book. But they are all lessons that I would not be able to teach her with my limited art ability and training. There is a supply list at the beginning of the book. You can either buy materials at your local craft store, or you can order them directly from ARTistic Pursuits Inc with your art curriculum. If you are buying them on your own, you can choose to buy all of the materials at once or when you need them. For example, the first six lessons have to do with water color crayons so you would only need water color crayons, water color paper, water color brush, pencil, paper towel, and water container for the first six lessons. You can add your other materials later if that is better for your budget. My daughter and I have really enjoyed working through this art curriculum together. The first lesson was a DVD lesson that taught us how to use the watercolor crayons and then add the water to make it look like a painting. I am not an expert at watercolor painting to begin with. But I never would have thought to use crayons first. The finished product looked so much better than if we had just tried to paint from the beginning. The next several watercolor lessons are just from the book. There is a famous painting to look at and then a lesson about what artists do like: artists compose, artists imagine, artists observe, and artists communicate. There was a specific assignment for each one. They each involved Clarissa finding something as a model and then drawing that on her paper and adding the water to make it a painting. The next video lesson was about mixing colors. It was interesting to put the lighter color first and then add the darker color. It didn’t always look very mixed with the crayons. But once the water was added, you could really see the new color. We are excited to continue on with this curriculum. We still have other mediums to learn about with construction paper and oil pastels in this volume. I am also looking forward to reading reviews from other families about the other volumes of the curriculum. I know that Clarissa would like to continue her art studies and I really like that this is a quality curriculum that requires very little knowledge or preparation from me. At $39.99 per volume, it is pretty affordable as well.